As promised, here's the details for this weekend's 4-day Independence Day celebration in GTA Online starting tomorrow. 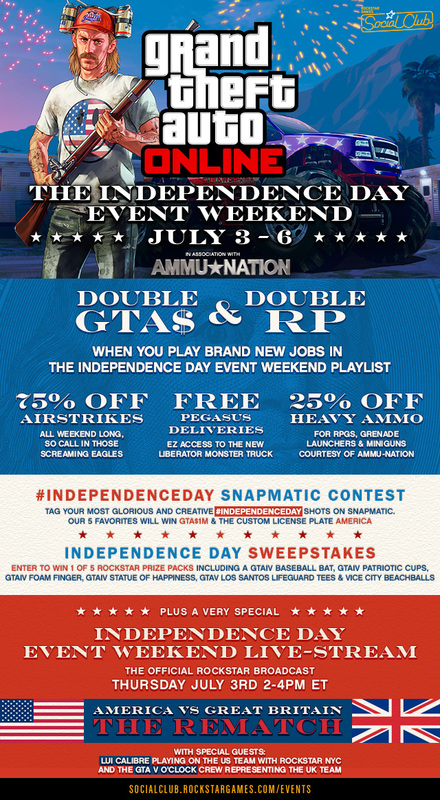 San Andreas will be celebrating the birthplace of freedom with big RP & GTA$ bonuses, patriotic discounts at Ammu-Nation, giveaways and lots more! The "Independence Day Special Event" Playlist is a special selection of some of the brand new Rockstar-created Jobs published this week including specific Races for new vehicles like the Sovereign motorcycle and the super-sized Liberator monster truck. This weekend only (starting tomorrow), this Playlist will score you Double GTA$ and Double RP. To access the Playlist, just go to Online > Playlists > Rockstar Created in the GTA Online Start Menu and select "Independence Day Event" from the options listed. 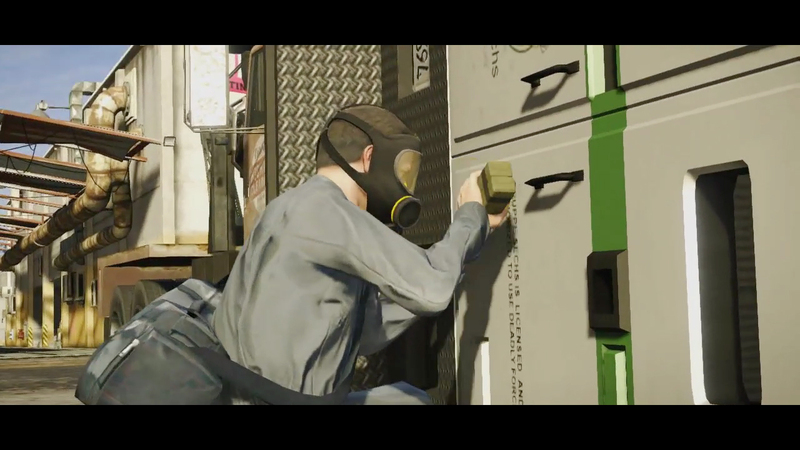 Alternatively, hit the Event button in the GTAV loading screens to launch straight into the Playlist. However you're commemorating the Fourth of July this weekend, Rocktar wants to see those Snapmatic pics showing your love for Old Glory. Whether you're rolling over foreign compact cars in the Liberator monster truck or setting off some fireworks in the yard of your new Paleto Bay abode, share your most creative, amusing or beauteous patriotic snaps for a chance to win GTA$1M and an AMERICA vanity license plate for your in-game vehicle. Join Rockstar at 2pm Eastern Time US tomorrow, July 3rd, for the revolutionary Rockstar Games Official Event Weekend Live Stream, showcasing a grudge match nearly 240 years in the making: it's America VS Great Britain - The Rematch. The US team will be represented by special guest Lui Calibre playing alongside Rockstar NYC devs while the UK team will be represented by the GTA V O'Clock Crew playing live from London - all hosted and commentated by Lazlow and the rest of the Rockstar Broadcast studio team. They'll be battling through a Crew Head to Head playlist featuring all new Jobs from The Independence Day Special. As always, they'll be streaming the show across the Social Club Events page, the Rockstar Games Twitch Channel and their YouTube Channel page. Join the chat and show your support, whether Yank or Redcoat. Rockstar will also be giving away five (5) exclusive prize packs of suitably patriotic and rare GTA gear in the Independence Day Gear Giveaway Sweepstakes. 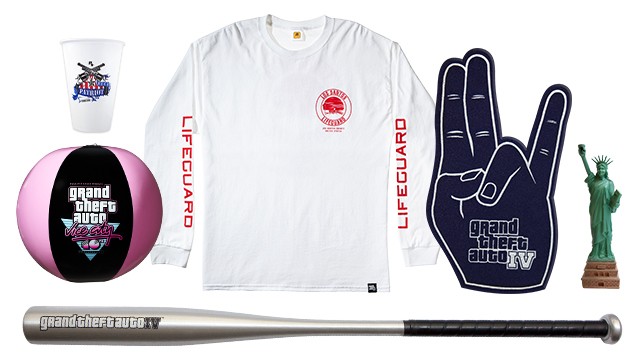 Each pack will include a GTAIV Aluminum Bat, Patriot Beer cup, GTAIV foam finger, Statue of Happiness figurine, plus a GTAV Los Santos Lifeguard tee and a Vice City beach ball. Ten (10) runners-up will each get GTAV tee and stickers. You can enter to win right now through Sunday here. See Official Rules. We still haven't heard anything from Rockstar about the West Vinewood Casino. Will we see this open and fully functioning in a future DLC? If so, we can probably expect to play similar games to those seen in GTA San Andreas with slot machines, blackjack, poker and roulette. Why not check out paypal-casinos.co and hone your skills while you wait? Enjoy and good luck! Find some friends to play with in the forums! GTA Online #IndependenceDay Weekend Event - More streams, contests, and sweepstakes to win this weekend starting tomorrow during the GTA Online Independence Day Weekend.